Trailhead is on Zealand Road in Carroll, NH (summits are in Bethlehem). Zealand Road leaves the west side of Rt. 302 2.2 miles east of Rt. 3. Parking is one mile down, on the right. Although they share a common name with a multitude of other mountains, these two Sugarloafs are far from ordinary. 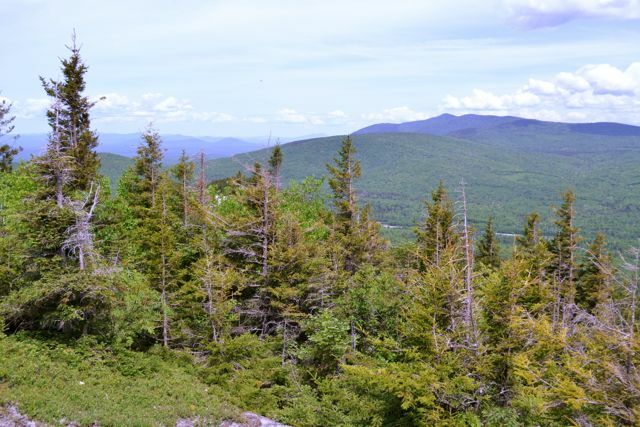 Middle Sugarloaf in particular commands one of the finest views for its small size in the White Mountains. The hike starts along pretty Zealand River. The trail follows the riverbank for 0.2 miles before turning left into the woods as Trestle Trail continues ahead. The trail ascends easily through the forest, crossing a snowmobile trail in the beginning. Watch for wildflowers on the side of the trail, like the painted trillium. Further up, the trail squeezes through the halves of a split boulder. Shortly after this, the trail becomes steeper and climbs by some rock stairs. The trail forks in the gap between the two mountains, 0.7 miles from the river. We recommend visiting North Sugarloaf first (turn right). The north branch of the trail circles around the top of North Sugarlaf and makes a short ascent to the ledgy summit in 0.3 miles. The summit rocks afford a one-directional view to the south, looking directly at Middle Sugarloaf. The south branch runs flat for a short distance, then ascends the mountain by switchbacks. Just below the summit, the trail ascends a very steep spot on a ladder. The summit is reached in half a mile. From the wide open summit of Middle Sugarloaf, the views are spectacular. You can see in almost all directions by exploring the expansive rock, but the best view is to the south toward the nearby Rosebrook Range, Mt. Hale, and the Twin Mountains. Also notable is the fine view of the Presidentials.